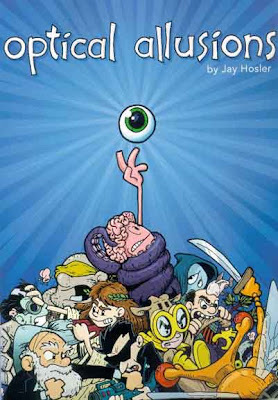 Who but Jay Hosler, Ph.D, would have dreamed up a scientific comic book about the eye? If you've read his other works, especially CLAN APIS, he's the first person that would come to mind. Is it boring? No. Actually, OPTICAL ALLUSIONS is a well-researched, highly effective graphic novel about the evolution of species, DNA, the scientific process of categorization, gene pools, and sexual dimorphisms all told within the context of the complexities of the different types of eyes. Like I said, no one but Hosler would even attempt it. No surprise here, OPTICAL ALLUSIONS is a fantastic, albeit it dense, scientific comic-prose hybrid. Wrinkles the Wonder Brain works for three women with one eye to share between them. He loses the eye and must embark on a quest to find the eye and return it to his employers. Like any great quest, Wrinkles must learn a thing or two before he can complete his goal. Learn he does. Unlike your science textbook, Hosler intertwines Greek mythology (as if you had not already pick up on that) science fiction and all manner of beast and body making the learning of science less like a biology lesson and more like an adventure in education. The fiction is clearly fiction and the science is clearly science. There is no twisting the two together. What Hosler does is intertwine a piece of the tale into comic format, then he follows it up with a text-based narrative dense with scientific explanation, examples, charts, figures and all the sciency amenities. We are left with a real science investigation that is clever, engaging and more importantly, understandable. It is a piece of comic-prose informational sharing that should make the National Science Foundation (who partially funded the effort) very proud. Before I wrote this review, I called my friend Paul, the high school science teacher, and told him - nay I demanded - he borrow my copy. It didn't take much cajoling, as he was open to any approach that would engage his student in the process of investigation. He used it, chapter by chapter with his high school biology class. I cannot imagine teaching biology without having OPTICAL ALLUSIONS on my shelf. One scene finds Wrinkles holding a sperm in one hand and an egg in the other while demonstrating the difference between acquired traits and inherited traits. When he realizes what he is holding, Wrinkles asks for some hand sanitizer. Hosler's humor is hysterical, but you should be aware in case that bothers you for some reason. This entire book screams “science classroom” on the high school and college level. There are so many scientific concepts inside that the biology teacher would be remiss in not using the book (or parts of it) in the classroom.